Leverett, MA Fiber to the Premise: A public private partnership that works. We have been talking about Municipalities and their desire to have reliable broadband and fiber to the premise for their communities for quite some time now. Since every community is unique, there is no clear-cut model of what a municipally initiated fiber network should look like. There are different examples all across the country. Most recently, we talked about our new relationship with Leverett, MA. Having become very well acquainted with the Leverett model, we’d like to share the details. Back in 2008, Leverett began to investigate the possibility of delivering fiber to the premise (FTTP) to all of its approximately 800 residences. To begin with, the town received a $40,000 planning grant from the Massachusetts Broadband Institute before the project got underway. The Leverett model consisted of the town borrowing (with voter approval) $3.6 million to hire a contractor to build the infrastructure that ultimately the town would own and operate under the authority of Leverett Municipal Light Plant (LMLP). The next element of the model was for LMLP to contract with a network operator to operate and maintain the infrastructure, and finally to contract with an ISP to provide customer service. After five years of preparation, construction began in June of 2013 and LeverettNet was complete by August of 2015. In the end, ONTs (optical network terminals) were installed on the exterior of 811 homes; the town installed 1,275 poles over 43 road miles. 65% of residents pre-subscribed for the service and within 2 months after completion, the take rate reached 80%. It is important to note that there is no competition in Leverett: no cable, a local phone company who refused to deliver fiber, and poor cell phone service. Today, LeverettNet contracts with two service providers to provide service on its network, a network operator and an Internet service provider. The network operator monitors and maintains the network, conducting the necessary repairs to electronics and ensuring that everything is running smoothly. Working hand-in-hand with the network operator, the Internet service provider provides Internet and phone service over the LeverettNet network, and handles all technical support and technical service. 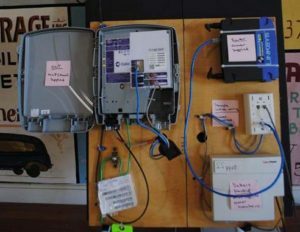 Fiber to the Premise, what about the cost? According to an article in TechDirt, the impact on property taxes for the median home in Leverett was an increase of $219 per year to pay for the construction bond. The ISP sets the rates for phone and the symmetrical Gigabit Internet service, and the LMLP calculates the network maintenance costs annually and divides that cost among the subscribers in a monthly fee. The bottom line based on current information, a subscriber pays about $106 total per month for bundled phone, long distance, and Gigabit Internet service – including $18 of his / her property taxes toward the municipal construction loan. 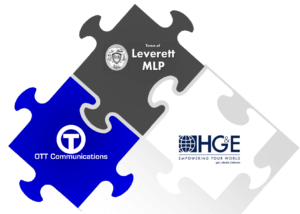 The Leverett example of municipally owned Fiber to the Premise infrastructure makes a good case for this type of public-private partnership. Towns where competition is non-existent, and where geography, economic climate, and demographics are similar might benefit from this model.